I took Cloe to a foster home a couple of weeks ago so we were in the exciting position of having a rescue space available. I realise as I write that I’ve not mentioned Cloe on the blog before. She’s a sweet elderly stray who we’re pretty sure was dumped. Her arrival was stressful and distressing through absolutely no fault of her own. She’s a little sweetheart and is now living it up in the most lovely foster home she could have dreamed of and her story will be told one day. As I was walking down the foster carers’ garden back to my car my phone pinged …. 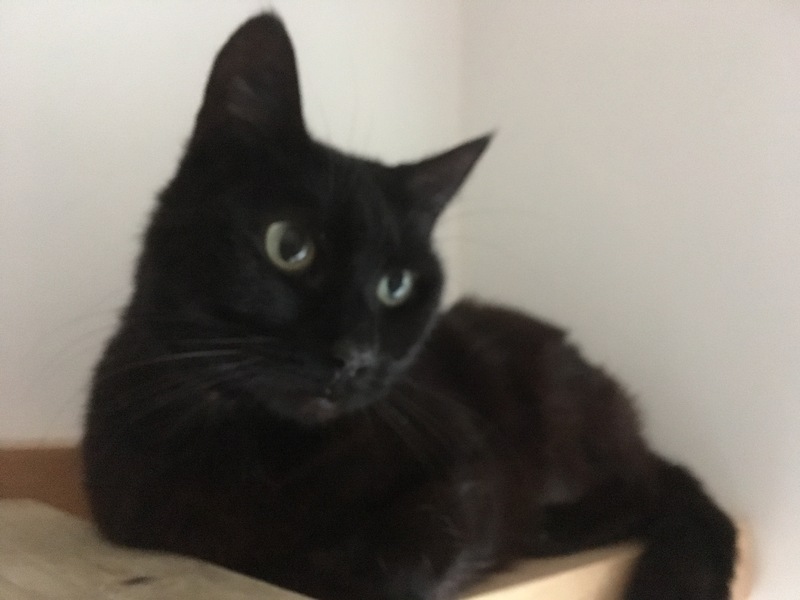 … It was a kind neighbour of an elderly lady who had sadly died the previous day, leaving a cat who needed a lifeline and a new home. 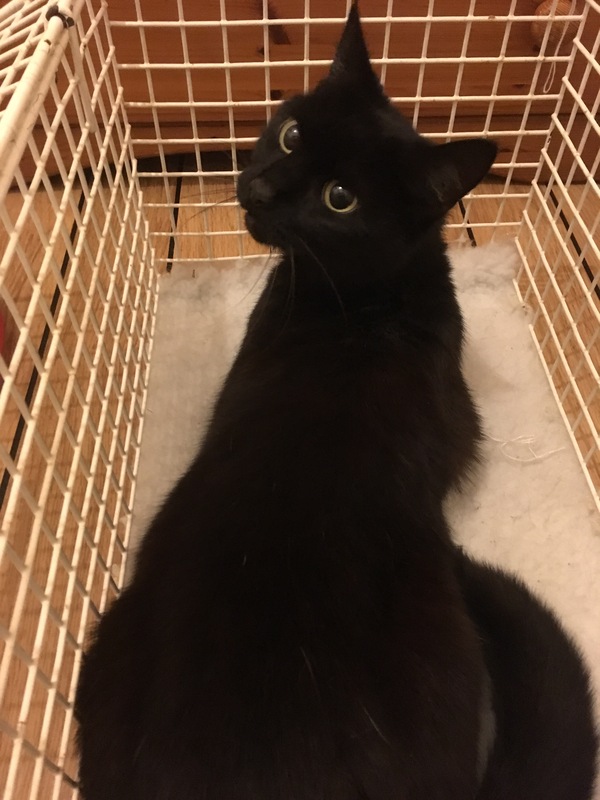 After checking that there was no one else who laid claim to the cat and that the lady’s relatives etc were in agreement that she came into rescue with us, we agreed to take her, checked she would be fed and safe for a couple of days and planned to collect her on the Saturday. Saturday is often the day I take my own elderly neighbour shopping. She’s about the best neighbour you could have but for the first 70 years of her life hadn’t been someone who had much interest in cats. It’s kind of changed in the 10 years I’ve lived next door to her as she’s listened to endless stories about cats and saved her spare bits of meat and chicken for the poor felines trying to eke out an existence with a veggie human. [Just to be clear … I’m veggie … the cats absolutely are NOT … but there aren’t any meat scraps coming off my plate for them.] It goes without saying that Henderson adores her …. not only for the treats but also because a while back when he had an altercation with “The Cat up the Road” while I was out at work, our neighbour came round, armed with a large piece of strong cardboard, bravely fought on his side … and they won! Anyway I digress. It’s not a turn that most people’s lives take at rising 80, but my lovely neighbour got involved in the trapping of the Norton 4. The N4’s garden was handily almost on route between here and Aldi … so it fitted in nicely to collect the trap on the way back from shopping. It was a similar occasion with the arrival of Skye. We’d done an Aldi shop but needed a few things from Sainsburys too and by the time we’d done it time was tight to get the shopping home and unpacked and back to collect cat. So off we went together to collect Skye. I’m telling you this just because it’s part of the story but also because people mostly assume that cat rescue people just do cat rescue and that’s what they’re paid to do. The reality is that for most rescue people, other than ones employed by the big rescues, we’re fitting it in, unpaid, around our day jobs and everything else we need to do. Anyway, we find the house and I knock on the deceased lady’s neighbour’s door. He answers and then goes to get his wellies and thick gloves. Uh oh! ? 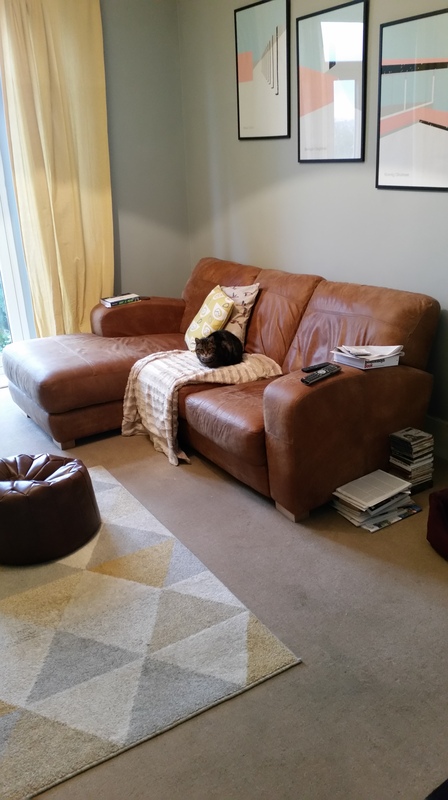 It transpires that his neighbour had been unwell for some time and hadn’t been able to keep on top of flea treatment … to the point that the carpet was jumping … hence the wellies. I have a brief moment of wellie envy. The house is rammed with a lifetime’s accumulation of stuff. It’s heartbreaking. 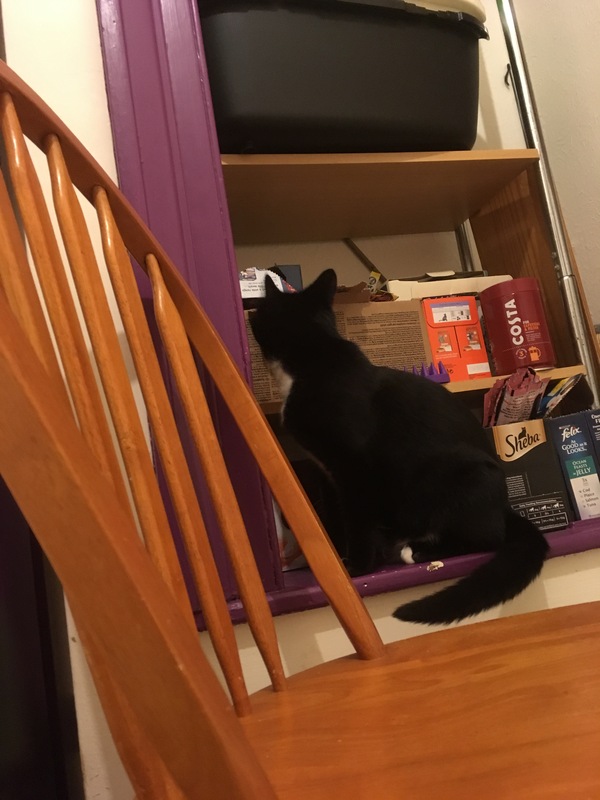 Thankfully the neighbour has had the foresight to close the cat into a small ish room, though it was filled with plants and furnished with high shelves … which of course the cat was right on top of. You know those moments when you wonder what you’ve let yourself in for? Hats off to the neighbour who took responsibility with his thick gloves for getting the cat into the carrier – most people would have stood back to watch me struggle. I wondered as I was putting the cat carrier in the back seat and putting her seat belt on, whether I should mention to my neighbour that the cat was bouncing with fleas, and on balance thought it was not the best plan. She got very stressed about a recent mouse infestation which had affected several of our neighbours but oddly enough left us untouched 😉 Drove home. 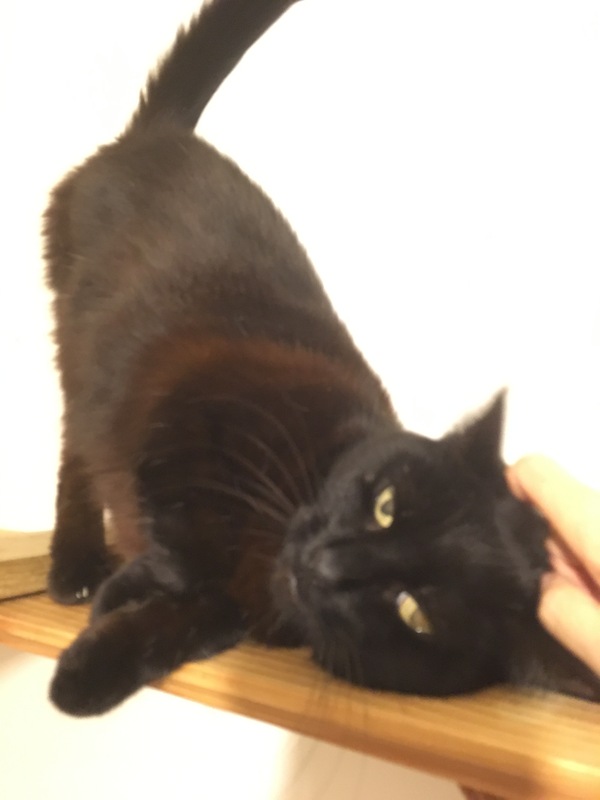 Left cat in car whilst I got neighbour safely into her house, rushed home, guessed weight of cat and applied appropriate sized Advantage … sprayed RIP fleas on stair carpet and around car …. then gathered up the shopping and took it round to neighbour … praying that nothing had jumped into the bags. Both very ready for a coffee by then. I love this “No Cat Cafe” just up the road – a haven in which to drink cat hair free coffee in peace 😉 We sat on the sofa and thanks to web cam were able to watch puss settling in to her new surroundings. There was a little while where she explored her igloo, but soon was hiding up high. It took a while to spot her. She stayed up there and on other high shelves for several days. She was clearly scared. It was a bit surreal to watch Finger .. one of the (used to be) very timid Norton 4 .. come into her room and try to reach her and reassure her. As you can see … we fetched in a chair from the other room. I climbed to to see her, expecting to be hissed at or even swiped at. Instead she leaned into the strokes and cuddles, purring loudly. The tricky bit then was avoiding her feeling all loved up, rolling over and falling off the shelf. 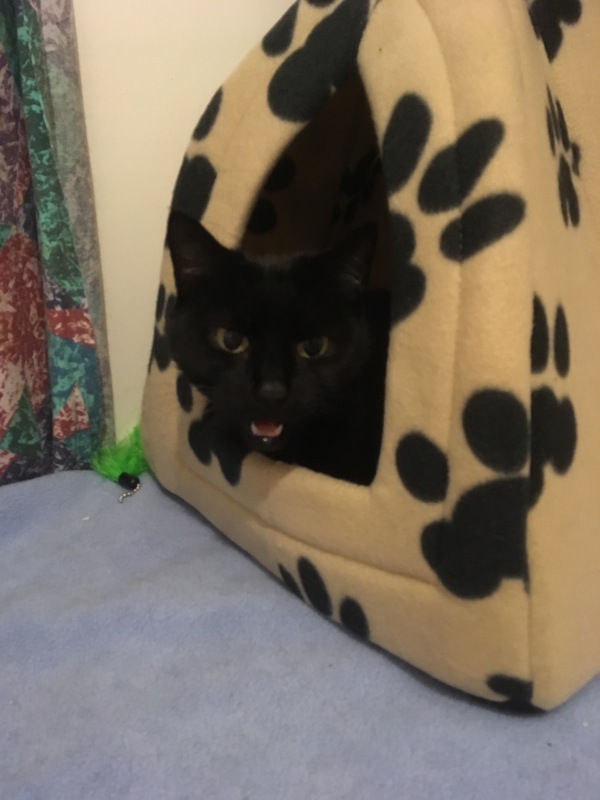 There had been some hope that she was microchipped and that that would give us a bit more info about whether she was spayed, her age … and her name! Once she was relaxed enough to cope with the scanner we checked, but sadly no chip. Our vets guesstimated her age at about 4-5, shaved her flank and found a scar which we’re 98% certain indicates that she’s been spayed … but her name?! We tried to guess what an elderly lady might have called her cat. We thought of calling her after the elderly lady as surely at least it was a name she’d have heard and recognized – but then thought it might confuse her. We looked at suggestions for black cat names and witchy names, and since she loves to climb thought about names of famous climbers (other than Ivy! … we’ve already had an Ivy). We went above all that and thought of Sky as that’s about as high as you can climb. We added an e because she’s beautiful … like the island.